JD is the only person to work at The Scuba Club with a college degree in diving. It seems a little odd to me that he is the only one but it’s true, JD has a degree from Florida Tech. During college he would road trip down to The Scuba Club to help out on dives. Unfortunately when he graduated there was not a position available here so he went home to Baltimore and worked as a commercial diver. JD burned up the telephone lines and letter writing (yes, that was the way that we communicated back in the 80’s) to let everyone here know that he was available and ready to start shaping The Scuba Club into the place it is today. June of 1980 all of his effort paid off and JD was hired full time at The Scuba Club. JD was born in Auburn, New York but grew up in the Baltimore area and learned how to SCUBA dive at 17. Rock quarries and sand pits were his dive spots up north but he knew that there was clear & warm salt water waiting for him in Florida. His plan to move south for college and a career in diving has paid off. 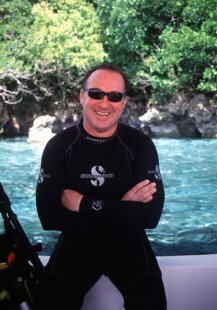 JD has been General Manager at The Scuba Club for over 30 years and you can here him say almost daily “I love my job”. It is interesting that he is diving as much this year as in the past years, and yes that says something about what great diving we have but also how different every dive can be. JD and Suzie are the proud parents of The Scuba Club dogs Willis and Wade, the well behaved greeters and protectors of the Club. Suzie also occasionally helps out at The Scuba Club and was certified by JD, hmmm interesting. JD’s photographs have appeared in publications such as Ocean Realm, National Geographic World, Sea Frontiers, Outdoor Explorer, Skin Diver, Scuba Times, Underwater USA, the Palm Beach Post and the Sun-Sentinel. Besides the local networks, JD’s video work has also been seen on National Geographic Television, the Travel Channel and Animal Planet. He is also working with the stock agencies Getty Images and Shutterstock. Check out more of his work at JDDuff.com. Over the past 38 years all of the good ideas that have happened at The Scuba Club can be tracked back to JD. From the new Point of Sale system, to the new web site, to Nitrox, to becoming a Scubapro Platinum Dealer, to getting Ken hired…you name it. If it is a good idea it must be JD’s. Traveling the globe, going barefoot to work and getting paid for it, if you want the best life on the planet, ask JD. He’s got it!